BBC NEWS | Entertainment | Does Africa want Band Aid 3? Does Africa want Band Aid 3? This Christmas will see the 20th anniversary of Band Aid commemorated with a new version of Do They Know It's Christmas?, together with the DVD release of Live Aid. As ever, the proceeds will go to Africa - but does Africa actually want them? 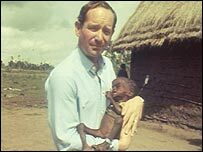 When the famine that struck Ethiopia in 1984 was highlighted in a BBC News report, musicians Bob Geldof and Midge Ure brought together a number of the world's pop megastars to record Do They Know It's Christmas? under the name Band Aid. The record raised and distributed $144m. "Truthfully, I believe all efforts to raise money for the aid work that we are doing here on the ground are excellent and essential," Siruti Mahotra of Oxfam, who runs a camp in Chad for refugee fleeing violence in Darfur, told BBC World Service's Analysis programme. "We on the ground use that money very much, in order to implement the work that we do... it is these types of events that allow us to be as flexible as possible in implementing our work." But in Ethiopia itself, feelings about Band Aid's new campaign efforts are mixed. Bjorn Lunqvist, a worker for Unicef based in Addis Ababa, said in the last 20 years the Ethiopian population has soared, and food aid is still required. "At least for the next 10 years, any additional resources will definitely help the country," he said. But many feel they have moved on since 1984, when the impact of a natural disaster - drought - was made far worse by the action and inaction of the Mengistu dictatorship. When drought struck again in 2003 - more severely than it had in 1984 - many fewer died, as the infrastructure to allow food to move around had been improved. Also, since 1991, the country had had an elected government, and food was no longer used as a political weapon. And relative stability has meant articles have even begun appearing in the Western press lauding Ethiopia as a holiday destination, pointing out its wildlife and long archaeological history. As a result, some are dismayed at the attention being drawn to Band Aid's 20th anniversary. They feel that this - together with a recent BBC documentary where Michael Buerk, the reporter who covered the famine in 1984, returned to the country - takes away the positive light they are trying to put on the country. "I haven't met anybody in the business sector in Ethiopia - whether in tourism or any other type of business - that welcomes the 20th anniversary," said Tony Hickey, who runs tour company Village Ethiopia. "What Ethiopia needs now is foreign investment and a flourishing private sector. "I know that when the BBC showed the Michael Burke film earlier this year, I had tour companies calling me up, saying 'should we cancel?'. "So this 20th anniversary is very bad news for us... 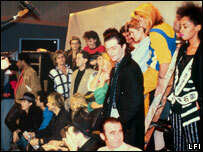 Band Aid and Live Aid project an image of Ethiopia which doesn't help Ethiopia or the Ethiopians." Mr Hickey added that he believed aid agencies, competing for people's donations and money, have a vested interest in making the situation appear as desperate as possible. "Perhaps they feel they always have to talk up the crisis in order to get attention... on our side we feel we've got to talk up the positive side," he said. 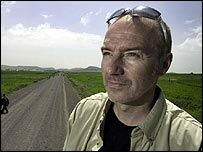 Midge Ure himself, returning to Ethiopia for Save The Children, said he was stunned by how much the country had changed. "I'd seen some horrible stuff back in 1985 when I went out with the initial Band Aid shipments, so going back to be subjected to that again I was really wary of," he said. "But going there, I saw that it was completely different - I saw smiling kids, people working, this beautiful country that is completely untouched." Representatives of Ethiopia's government said that in some respects they hold a similar view. Fisseha Adugna, Ethiopia's ambassador to London, told Analysis he did not believe a revival of the memories of 20 years ago was helpful today. "Live Aid's humanitarian assistance is not our destiny," he said. "Our destiny is economic growth. This will grow if investment and trade come to our country." Mr Adunga also highlighted changes that the current government has made, including much increased coverage of primary school provision, more hospitals, and measures taken to prevent effects of drought. However, he did stress that the country now wants partnership in trade to be the cornerstone of improving its prospects. Mr Adunga pointed out that Ethiopia lost around $900m from unfair coffee trading in the last five years, and last year had to pay $150m to service its debt. "If you combine all of this, it is more than $1bn," he said. "If we save that amount of money, then how many schools and hospitals would have been built in Ethiopia?" 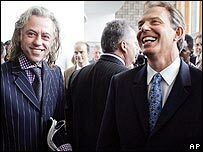 And it is debt and fair trade issues that Bob Geldof himself - who is not actively involved in the new Band Aid single - is now trying to address. He has been championing the Global Commission For Africa, set up by British Prime Minister Tony Blair. It involves 17 Commissioners - including the Ethiopian PM - trying to ensure they can work together to increase funds and press ahead with development. "Debt, trade, aid are givens to me, and they're not difficult political propositions - but other things may be," he said. "They have to be negotiated through... if that conclusion can be politically active, then we've got somewhere." What do you think of new single?